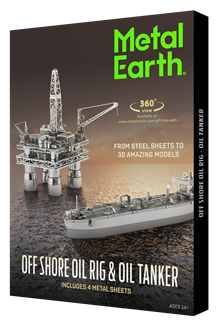 Off Shore Oil Rig - Is a large structure with facilities to drill wells (optionally), to extract and process oil and natural gas, or to temporarily store product until it can be brought to shore for refining and marketing. Oil Tanker - Is a merchant ship designed for the bulk transport of oil. There are two basic types of oil tankers: crude tankers and product tankers. This 5 piece model train consists of five 4" x 4" steel sheets from which individual parts can be removed to assemble a museum quality model using tabs and holes. This Freight Train set includes 5 train cars including the Diesel Locomotive, Gondola Car, Box Car, Hopper Car and Off Center Caboose. The connected model length is 17 inches. 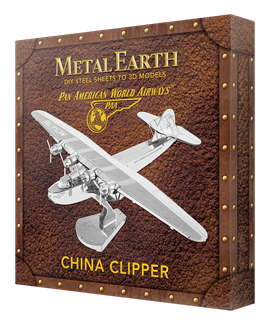 China Clipper (NC14716) was the first of three Martin M-130 four-engine flying boats built for Pan American Airways. In November of 1935 it was used to inaugurate the first commercial transpacific air service from San Francisco to Manila by way of Honolulu, Midway and Wake Island. It continued to fly the Pacific for the next eight years carrying approximately 3,500 passengers and 750,000 lbs of mail and freight.